These days my painting schedule is set primarily by my children. I only have a few hours in the morning of most weekdays, and a bit of nap time in the afternoon. It makes for a broken day, but I enjoy my mornings. Knowing I only have a few hours to paint, I allow myself to just go to a fun location and enjoy painting. 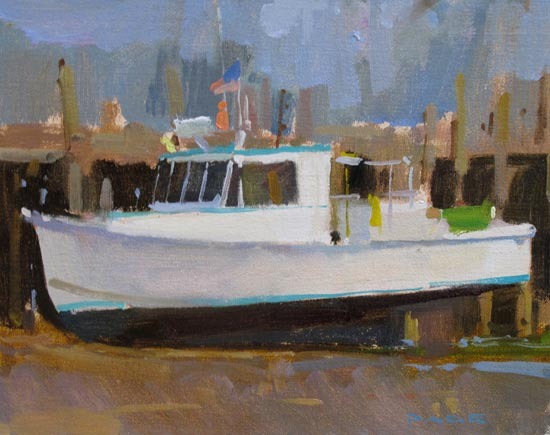 The summer is finished, and I can use these nice days to just get in some fun landscape and harbor paintings. The painting above is from a workshop I taught a few weeks ago. What I really liked about this scene was how well the values are organized. The lighter value of the boat is a nice simple shape described by the darker values of the ground, pilings and sky. It’s a simple composition, which is what makes me like it. Often a simple organization of values makes for a stronger image, and allows for space to play with subtle color variations within that structure.